Can you hear that train whistle? That’s the sound of the 20th Annual Rails in the Rockies exhibit rolling into Estes Park on President’s Day weekend, February 18-19, 2017, at the Estes Park Events Complex. Check out the LEGO train layout, watch a train switching yard operate, and listen to a train whistle echo off papier-mâché mountains. Model railroaders from throughout Colorado have crafted detailed models of United States and British railroads, featuring train models from the age of steam trains to the present. Kids love these shows, so make sure to bring the whole family. At the interactive “Kids Layout,” children can operate the model trains themselves. They will love playing the Seek and Search game. Sponsored by the Estes Valley Model Railroaders Club, the show boasts more than 20 model train layouts that spread out over more than 19,000 square feet. All sizes of trains are represented: from “Z” scale (1/220 actual size) to “O” scale (1/48 actual size), and everything in-between. Learn railroad history and watch demonstrations on how railroad hobbyists construct scenery. The Estes Valley Model Railroaders Club promotes interest in trains, model railroading, the history of railroads, and encourages the art and craft of model railroading for both youth and adults. So if you catch the model train bug, there are vendors at the Events Complex to sell model trains and other railroad-related products. Show hours are from 9 a.m. to 5 p.m. on Saturday and from 9 a.m. to 4 p.m. on Sunday. Admission is $7 per person. Children under 12-years-old are free with an adult. Family maximum of $20. Parking is free. 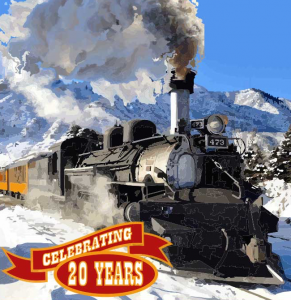 For more information about the event, contact the Estes Valley Model Railroaders Club at info@railsintherockies.org.